Trailside School Garden: All Grown Up! 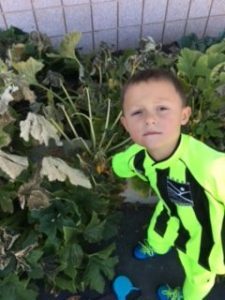 At the School Garden at Trailside elementary school, a Garden Journal is being kept where students record their activity and observations in the garden. Grace and Dave Symons wrote in late August: “Picked up some garbage today and some dead leaves under the squash plants; green onions need to be harvested but will wait to see if teachers want them; harvested some heads of lettuce; we sang to the beet and onions.” Singing to the garden may be the secret to it’s success! As the school year began, the Trailside School Garden was in full bloom! Teachers were asked to take advantage of all the edible goodies as their schedules and core standards allowed. There were lots of herbs (chives, lavender, thyme, cilantro and oregano) along with lettuce, celery, radishes, carrots, beets, squash, broccoli and cherry tomatoes. The green tomatoes could be picked and allowed to ripen on a window seal to see how the colors change. The Trailside School Garden is made possible by a grant from Whole Kids Foundation. If you want to continue to support school gardens, please consider a donation to EATS. The Trailside School Garden is also prospering due to the dedication of one inspired parent, Sarah Tessler. If you would like to help Sarah continue to make the garden successful, please contact her at sarahtessler211@gmail.com.